Funding Source: NSF EarthScope: EAR 0454372 and EAR 0454541. 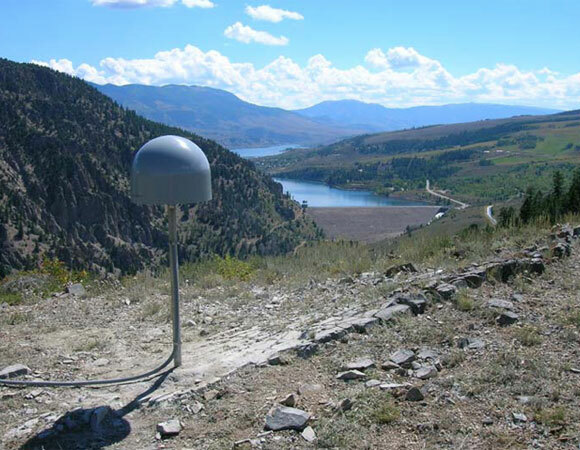 The Rio Grande Rift GPS Experiment, funded by the National Science Foundation's EarthScope program, provides a regional enhancement to the broader Plate Boundary Observatory (PBO) network. Its purpose is to measure relative motions at the Earth's surface and determine how the Rio Grande Rift region in Colorado and New Mexico is deforming. 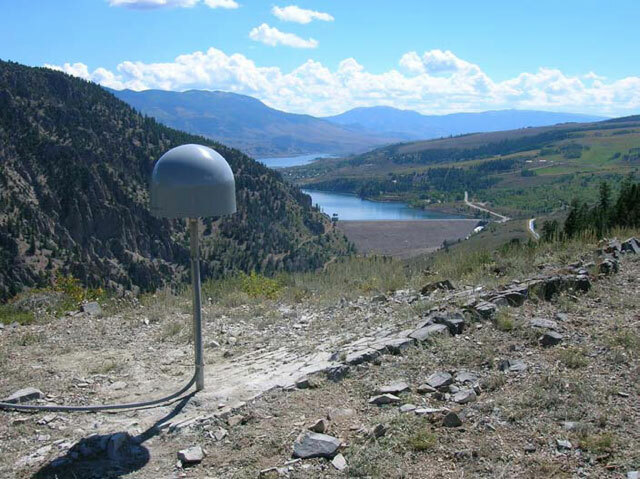 As the results published in the journal Geology show, the Rio Grande Rift GPS network has answered the fundamental question in the affirmative: "Is the rift still active?" 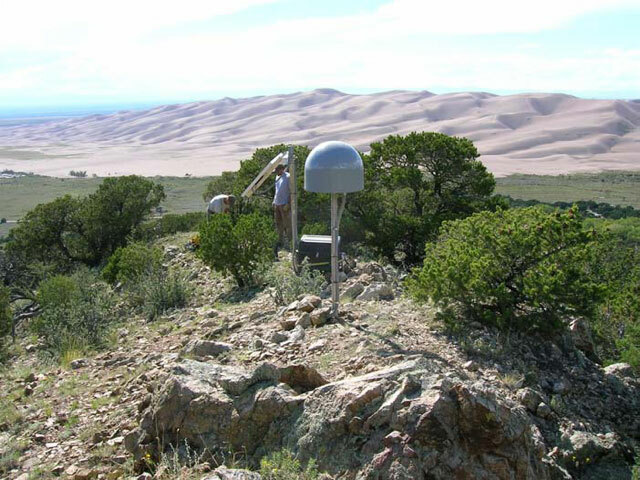 Construction and instrumentation of the experiment's 25 GPS monuments located in Colorado and New Mexico began in 2006 and was completed in June of 2007. The project is a collaborative effort among several universities, including the University of Colorado, University of New Mexico, New Mexico Tech and Utah State University. UNAVCO engineers from the Facilty, PBO, and Polar programs carried out the installation of the monuments and instrumentation located at each site. Researchers and students from the participating universities have operated and maintained the network during the past five years with UNAVCO support for troubleshooting and archiving data. Funding for the project was recently renewed by the NSF-EarthScope program, allowing for an additional 3 years of operation and maintenance, which will now be conducted by UNAVCO personnel. Figure 1. 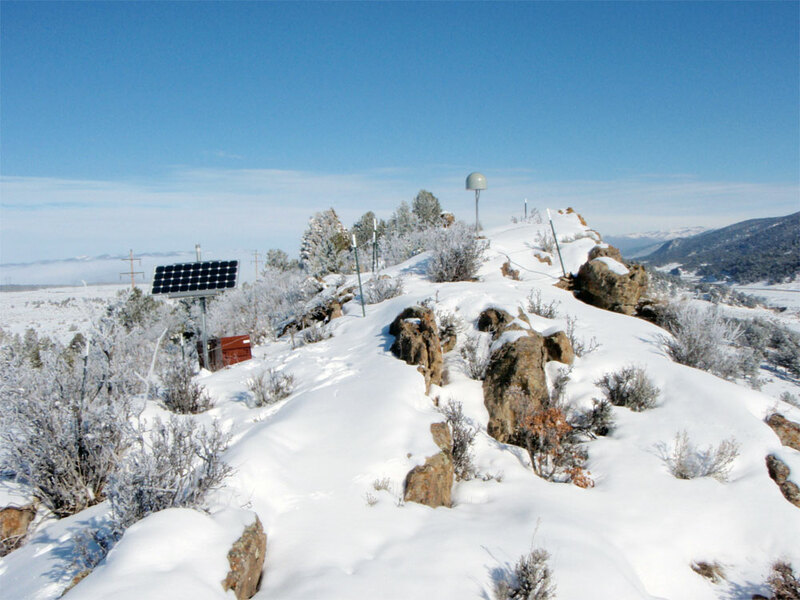 RG20 located near the summit of Red Mountain Pass in southwestern CO. 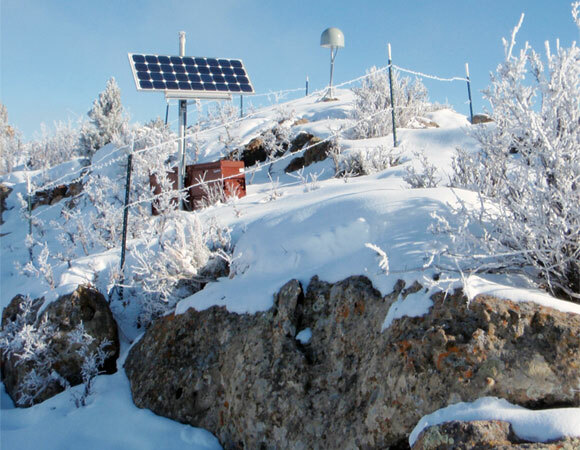 The site is collocated with a regional weather station. Figure 3. RG22 overlooking Great Sand Dunes National Park. Figure 4. RG14 in the winter during a site visit. Photo credit Henry Berglund. Figure 5. RG14 in the winter during a site visit. Photo credit Henry Berglund. The high-precision instrumentation installed as part of the experiment has provided geodetic measurements of unprecedented accuracy and precision for this particular region. 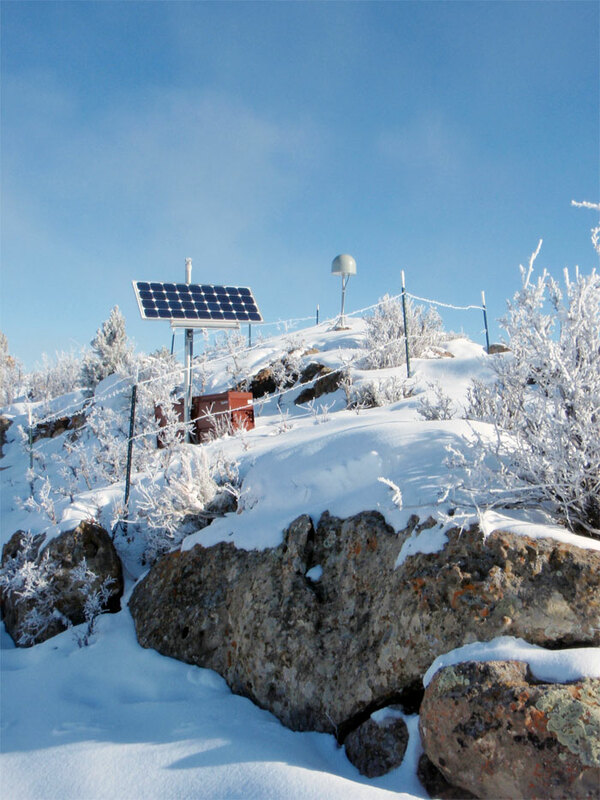 The RGR Experiment was the first regional enhancement of PBO to be funded by NSF using the PBO Portable Instrument Pool, and its success will pave the way for others in areas such as eastern Oregon and the eastern United States. Historically, measurements of deformation within continental interiors have been difficult to capture due to the typically slow, but still geologically significant, rates of deformation within them. This enhanced network of GPS monuments has provided the most detailed measurements of the Rio Grande Rift region to date. A recent article released by the research group has shown that the rift is actively extending. A link to the article's abstract can be found here. In the next year several of the sites will be upgraded to include telemetry. 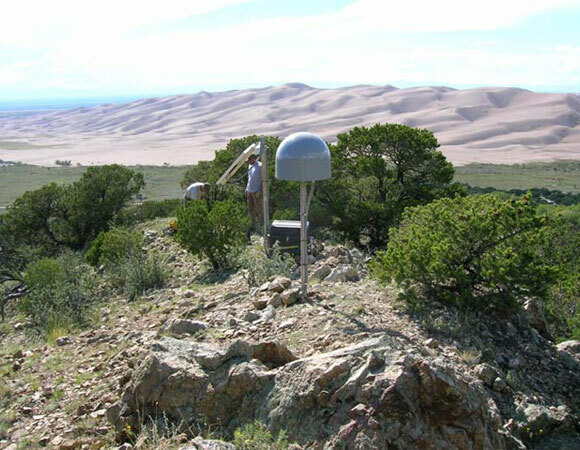 Previously, only one of the 25 sites (RG12 located at the Philmont Scout Ranch near Cimarron, NM with internet provided through the courtesy of the Boy Scouts of America) has been remotely accessible, while the remaining sites have required periodic visits to collect the data. This project would not have been possible without the permission from private landowners to locate sites on their property. We'd like to thank them for hosting these monuments. Weather and Nature have provided some interesting challenges for the project leaders. Lightning damage had to be repaired at a site located near Red Mountain Pass. 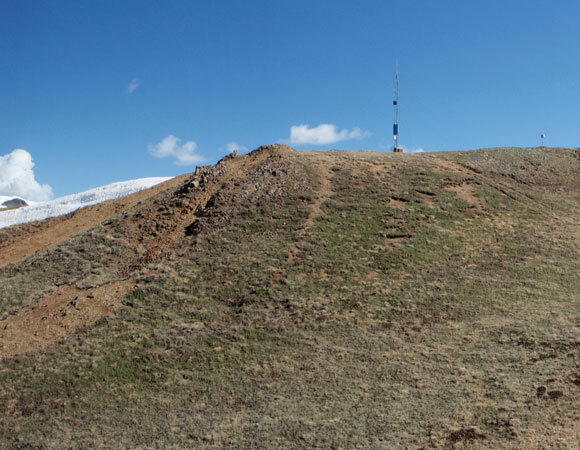 An elk rubbing its antlers against the monument likely caused damage to the antenna dome at a site located near Empire, CO.